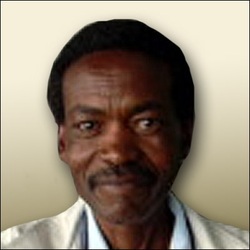 Basil Baqwa Was born in Soweto in 1954 and he attended school in Jubalani. He loved painting and sketching in his spare time when he came home from school. After finishing school he found a job in an attorneys office cleaning and making tea for the staff. At night and over weekends he would visit artists such as David Mbele, Godfrey Ndaba and Ben Macala and would sketch with them. They gave him the basic technique to use art materials and to view subjects and to develop a style of his own. Although he slowly worked himself up in the office to filing, his love of art made him stop working and concentrate on painting. 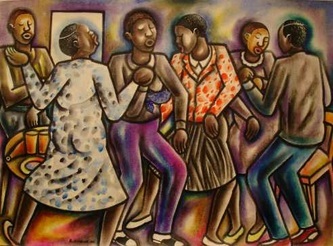 He went to the curio shops to sell his work but he was not satisfied so he joined the Fuba Art Centre and started exhibiting with other fellow artists at their exhibitions. Exhibitions were held with groups in Cape Town, Durban and Bloemfontein. Art lovers, tourists and corporations have bought his work locally and overseas. Basil was commissioned to do a piece of art for an ICC billboard welcoming the Kenyans to South Africa 2003. The billboard shows the Kenyan cricketers being welcomed to South Africa by the cricketers holding their bats in the same way as the Kenyans hold their spears.